Windwool Cloth is the new cloth type coming in Mists of Pandaria. It drops off of any humanoid in Pandaria, the higher the level of the humanoid, the higher the drop rate. It is used in the early tier Tailoring recipes to make PvP and level 85-87 PvE/leveling gear. In both Cataclysm and Wrath of the Lich King Northern Cloth Scavenging played a critical role in increasing Tailors drop rate of cloth. If you didn’t have this ability you could not really farm Embersilk or Netherweave efficiently. We don’t know yet if this passive will play a role in Mists of Pandaria, if it will be replaced with something new or if Blizzard will level the playing field by letting everyone farm windwool cloth equally. Windwool is good to farm because it sells at a very sable rate. There’s little or no chance that you will farm a bunch of Windwool only to find out that you can’t find a buyer. Tailors use Windwool very quickly, since Bolts of Windwool Cloth are their main reagent. You should sell Windwool Cloth in stacks of 20 on the auction house or in bulk in trade chat. Update: You can make a lot of gold with Windwool Cloth, but if you want to step it up and make thousands of gold you should read my personal favorite guide. Like I mentioned above, all level 85-90 humanoids in Pandaria drop Windwool Cloth. The trick is to find an area with a high density and fast respawn of humanoids. I have a few favorite places, if you have any of your own please share in the comments below. Yep, this is actually a place I found while leveling. The Ordo and the Ruqin, is that what you were talking about? Are there any like there are embersilk? Potion of Treasure Finding does not work in Pandaria. Potion of Plunder (I believe is the name)is what is required. I have seen none of these on my server as of yet. No, he’s right, Treasure Finding is made from 3 golden lotus. I found that Windward Isle (the little island on the top right of Jade Forest) is a really good place to farm the cloth. Also lots of motes of harmony drop as well as lockboxes. went to these places you have circled, killed all the ordo and never got one piece of cloth. tried all the circled places and the cave above One Keg, in total 7 pieces of windwool cloth… Really not worth it. Haven’t tried windward isle yet. Actually, I just farmed for about 1.5 hours in the one keg cave (Howlingwind Cavern, I believe it’s called) and I got almost 100 bolts. You must just have had rotten luck. The specific areas do not have any higher of a drop rate than other areas. 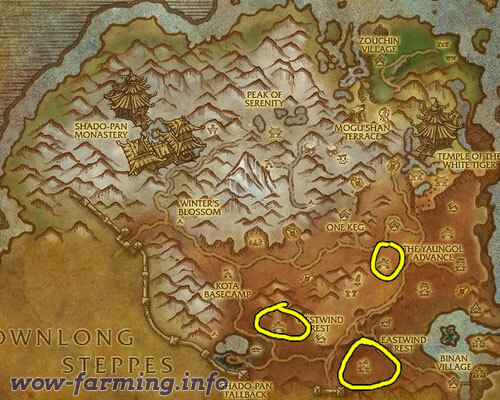 These are ideal farming places due to the quantity of enemies. Most humanoids have the exact same drop rate as any other humanoids. Simply, you’re just unlucky. The spots however are fine. Might be a dumb question, but do you have “Northern Cloth Scavenging”?? Can confirm extra windwool drops for tailors. A friend an I were farming osul with free for all loot on. She looted, and I still had loot waiting for me — just windwool. We worked the routes above for 45 min and got 6 stacks. All of the circled places work fine. they don’t drop like embersilk does in Deepholm, but they do drop almost every kill. you are such a troll, this is the WORST place to farm. 1 cloth per 5 kills, horrible! Well.. i found the Howlingwind cave the best place to farm windwool cloth. I’m almost at 600 in Tailoring so that helps alot on the drop. I tried farming with my DK, wich do not have tailoring, and i used 45minutes to get stock. With my rogue (Tailoring) i used 10-15 minutes on just over 1 stock. So i would say, Howlingwind Cave is the best place to farm Windwool Cloth. I am afraid that most of the posters are cloth masters and get cloth drops from everything in the game. Making it impossible to truly judge the worth of a spot for active farming. I find the windward isle drops more Exotic Leather than Windwool Cloth. Then again I am a 600 Skinner. Ok 2 mages using potion of luck, 1 600 tailor/cook. In 15 minutes tailor collected 60+ windwool and various other goods to sell or cook. So tailors have the ability it would seem to collect 240 cloth an hour at an average AH price of 35g (my server) …. or 4200g an hour plus added gold/loot drops. i know of a good place to farm windwool. the cave by arboretum, it contains the brew hozens. they drop alot of windwool and motes. also the island in upper left corner, has the area of sprites they also drop a good amount of windwool. The place that I would recommend is Dread Wastes. The Dread Wastes zone features a large Sha-touched zone, with ends touching the Gate of the Setting Sun and the Serpent’s Spine near the Valley of Four Winds. About mid-way along each of these arms, you’ll start encountering groups of Mantid warriors, led by a Mantid Slayer. These are perfect for pulling as a group; as a Blood DK, I’ve simultaneously pulled two of these groups, two of the wandering scorpion riders AND a patrolling stone giant, all at the same time. By focusing strictly on these “mid-arms” and concentrating on these particular mobs, I’ve spent an hour farmign and gotten an average 4 Spirits of Harmony and many stacks of Windwool Cloth. there is another place in krasarang wilds, note you may want to be fairly geared or a tank that knows what you are doing. and you have to have at least unlocked the dominance offensive dailies. A greate guide to widwool cloth farm, but a comment to youre footnote on lvling guide. I’m a casual gamer and my playtime is 4 days – 10 hrs – 16 min from lvl 1-90 where I got over 7 hrs on lvl 90…. kun-lai summit. the ordos villages worked very wel for me. 40 minutes of farming, so potions of luck gave me. 4 harmony, 81 bolt, 30+ greens to DE, 27 black trillium, 24 white, 21 ghost iron, and 17 exotix leather. plus around 400 gold.